After paying tributes to the martyrs of the Indian armed forces in Tezpur, Arunachal CM said that No one deserves the title of a ‘Hero’ more than a soldier. Chief Minister Pema Khandu today paid rich tributes to the martyrs of the Indian armed forces, who sacrificed their lives in service of the country and countrymen. “No one deserves the title of a ‘Hero’ more than a soldier. The brave men and women in the Indian Army, Indian Air Force and Indian Navy stay away from their families, miss every significant thing in their lives and give the ultimate sacrifice so that we can be with our loved ones and sleep peacefully at night,” said Khandu speaking to ranks and files of the Indian Air Force officers and jawans here at Tezpur Air force Station today. 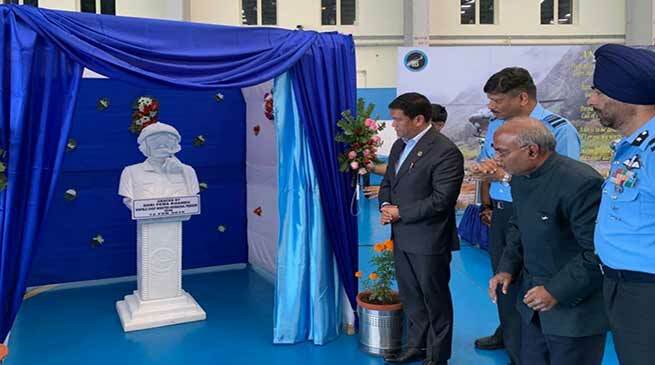 Khandu unveiled the bust of eternal Air crew installed at the Air force Station- Tezpur, who sacrificed their lives when the Indian Air force chopper which was on rescue operation, met with an accident killing all onboard near Sagalee in Arunachal Pradesh in the year 2017. The helicopter was evacuating people stranded due to massive landslides caused by heavy rainfall that year. Paying tributes to Wing Commander Mandeep Singh Dhillon, Flight Lieutanant Pramod Kumar Singh and Sergent Rajendra Yashwant Gujjar, Khandu said that the people of Arunchal Pradesh will remember the supreme sacrifice made by these heroes of the IAF. He also remembered the supreme sacrifice of the state Police personnel, who was also on duty in the ill-fated chopper. “The true sons of the soil were never deterred by the inclement weather that came their way. They airlifted hundreds of stranded people of our state to safer locations before the tragedy struck like a bolt from nowhere. The survivors who were airlifted by these heroes are still in shock as they couldn’t even thank their saviours for their valourious services. The people of Arunachal Pradesh join in mourning the sacrifice of the great soldiers of our country. They were true patriots indeed,” said the CM on an emotional note. Khandu informed that, as a mark of respect to the brave hearts, who sacrificed their lives in the line of duty for the country, Arunachal Pradesh State Government gave Rs. 50 Lakhs each to next of kin as ex-gratia relief. He said the state government had substantially enhanced the rate of ex-gratia payment to Central Armed Forces and Central Para-military forces operating in Arunachal Pradesh as a mark of respect and gratitude to them for sacrificing everything in service of the nation. The Chief minister also expressed gratitude to the Indian Air Force for helping the state during all kinds of crisis and extending support whenever sought for. Air Marshal Sandeep Singh, AVSM, VM, Senior Air Staff Officer, Eastern Air Command and Air Commander Tejpal Singh, VM, Air Officer Commanding, Airforce Station Tezpur and the Arunachal Pradesh Chief Secretary were present on the occasion.